Whether you are a military personnel shooting on private land, or an individual preparing for the hunting season to catch some fun, always think safety. The eye needs protection from fragments, flying bullets and other things that pose risk to them during your shooting exercise. So if you really want to avoid any casualty and enjoy your shooting exercise, what you need is the best shooting goggles. You don’t have to spend a fortune to get good shooting glasses that will meet your needs. With a little bit of research, you can buy your first glasses like a pro. There are different materials used in making goggles or glasses. Once you become familiar with the features and properties of these materials, making the right choice will no longer be challenging. The first step to take when planning to buy a shooting glasses is deciding on how much you have in mind to spend and holding on to that. There are many affordable and good quality brands you will find on the market and you might get tempted to spend above your budget. You can determine the price range of some of the best brands by reading shooting glasses reviews online. Polycarbonate is the same material found in bullet-resistant glasses, so it is probably the best lens material on the market. It is scratch resistant, durable and light weight. Impact-resistant makes polycarbonate an ideal protector against bullet splatter and ricochets. Polycarbonate also offers high inbuilt UV (ultraviolet) protection, too. Because of their light weight as well as optical properties, Trivex lenses are regarded as the best when it comes to precision shooting. They are lighter, stronger and clearer than other lenses but are more expensive. The CR 39 is a plastic lens with about the same weight as polycarbonate. The major difference with polycarbonate is that it does not have great impact resistant properties and also offers little or no protection from ultra-violet rays. Hunting glasses are built with scratch-resistant, anti-reflective as well as rainbow coatings. When buying a shooting glasses, remember that glasses with intensely dark coatings normally would have a negative impact on light transmission. Glasses with lenses coated with the scratch-resistant material will protect the lenses from damage. The main reason you are buying a shooting glasses is to protect your eyes, so the lenses of any brand you buy should be long enough to cover your eyes. This will help protect your eyes from flying debris and let you have good coverage from all directions. The gift of sight is one of the precious and most cherished gifts in life. They are so precious that without them, life would be meaningless. You have every reason to protect your eyes as you engage in your shooting excursions. Using good quality and top-rated shooting glasses can save your life and protect your eyes. In most shooting accident cases, eye goggles could act as the best defense, preventing sharp metal objects from penetrating your brain through your eyes. You need to use eye protection when dealing with firearms because accidents can happen at any time. And remember, prevention is always better than cure. Revision is one of the brands committed to producing quality and affordable shooting glasses for hunters and military personnel. The Revision Military Hellfly Ballistic Sunglasses are one of the best shooting glasses for the money with tons of great features and quality. This shooting glasses come with a pouch and case, something most overpriced glasses are lacking. In addition to being budget-friendly, this shooting glasses meets the US MIL-PRF-31013 standards for spectacles and would probably exceed the ANSI ZB7.1-2010 standards. So you are sure of giving your eyes the best protection when you use it for any shooting exercise. Having 2.2 mm thick lenses built with impact-resistant and optical grade polycarbonate material makes it a great high protector during any shooting exercise. It also offers high visual clarity and completely protects the eyes from harmful ultra-violet rays. Thanks to the wrap-around design, the Revision Military Hellfly Ballistic Sunglasses are able to protect the eyes from unexpected fragments and dust from all angles. It will also give you good coverage from all directions. The design also makes it comfortable to wear. 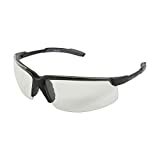 If you are looking for the best shooting glasses that can withstand the rigors of daily wears and frequent use, choosing this shooting glasses will be a wise option. It meets the GL-PD10-12 standards and surpasses the MIL-PRF-31013 standards for ultra-violet protection, impact resistance, and optical clarity. Both durability and physical eye protection of this shooting glasses are improved, thanks to its nylon-based triloid frames. It has no fit or comfort issues as seen in most overpriced shooting glasses. The padded nosepiece coupled with the patented temple adjustments makes it fit properly. The Wiley-X Saber Advanced Shooting glasses are one of the best shooting glasses in terms of lens quality. Though the lens requires more force to swap or remove, it will not fall out easily if impacted. The lens is also thick and can take a hit without harming your eyes. 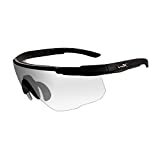 This shooting glasses are built with clear lenses and is great for indoor or average conditions. The lenses are coated with anti-fog and anti-scratch coatings for enhanced durability and give you better vision. In addition to superior lenses, the adjustable nosepiece makes the shooting glasses worth buying. Shooters that desire comfort and protection will find the wrap-around frame design which has dual injection rubber temples helpful. The non-slip rubber nose will let the shooting glasses stay comfortable on your face. Also, this shooting glasses meets the ANSI Z87+ high velocity as well as the CE ISO 12312-1:2103 standards. This is probably one of the best prescription glasses on the market. Its large size makes it fit over a prescription glass well. The clear lenses are perfect for standard lighting conditions and daily usage, too. In addition to preventing fragments from penetrating your eyes, the lenses give 100% UV protection to the eyes, too. 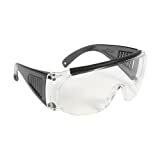 Overall, the Allen over Shooting & Safety Glasses is sturdy and has a great fit and finish. It comes with a top pad, great to wear with or without glasses. When worn on prescription glasses, the top pad helps to keep the glasses in place. The last but not the least on the shooting glasses reviews is the Honeywell’s Howard Leight Shooting glasses. The UVextreme anti-fog lens coating of this shooting glasses makes it unique and combined with a ventilation channel, fog and moisture are greatly minimized. Having a flexible and soft brow-guard coupled with adjustable templates makes it more comfortable to wear. And just like other brands mentioned in this shooting glasses review, the clear lenses of the Honeywell Howard Leight glasses makes it suitable for shooting in virtually almost all indoor and outdoor environments. Honeywell’s concern for quality makes them one of the shooting glasses manufacturers in the business. The Honeywell’s Howard Leight Shooting glasses meets the ANSI Z87.1-2010 high impact standards, including the CSA Z94.3 standard. It also satisfied the military V0 ballistic impact test requirement which is way higher than ANSI. There are tons of shooting glasses on the market, but these five products have met our requirements. And if you are working on a low budget, these are the best shooting glasses for the money that will meet your needs and budget-size. Safety should be the first thing on your mind when going for a shooting exercise. The eyes are the first part of the body you need to protect because of the risk they are exposed to. We have listed some of the best shooting goggles you can find on the market, now is left for you to make your choice.